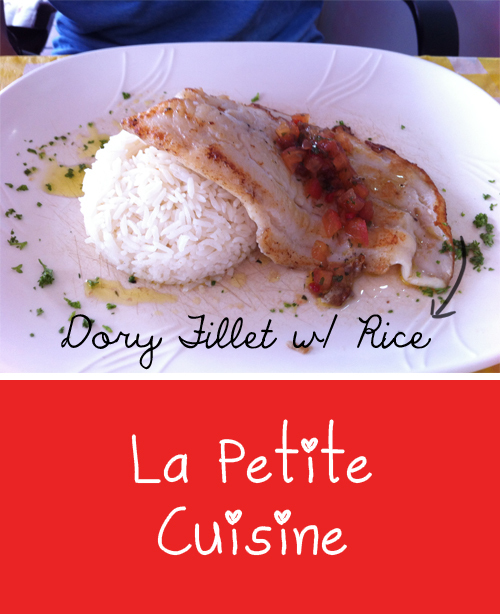 I've been wanting to try La Petite Cuisine for quite a while, and Lihai and I finally did when we were around the Cluny area. La Petitie Cuisine is known for it's French fare at affordable prices, which explains why it was crowded when we got there. This despite the fact that we got there slightly before noon. Due to the crowds, we decided to just have a quick meal. We got the mushroom soup to share, which was nothing special. Got myself the prawn and foie gras ravioli as my main, even though it's actually under the entrees. I don't usually order cream sauces to go along with my pasta cos it makes me jelat, and I absolutely hate that feeling. I used to like carbonaras and all when I was younger..but somehow after turning into a teenager, I never liked it again. Even so. I just had to get this dish cos it has my three favourite things! Prawns + Foie Gras + Ravioli. How to say no right?! The portion was just nice for me, cos by the second one, I was feeling jelat already. It was really yummy, but I just couldn't take the cream sauce. Luckily they had some tomatoes, which helped to make it taste less creamy in my opinion. Lihai tried it and liked it, and even though I find it jelat, I would still return for this dish! Lihai got the dory fillet, which was good but nothing to write home about. We will definitely return if we are around the area, and perhaps the next time we would try their more well-known dishes like Duck Leg Confit and Escargots with Croissant.